CERN-like organization will oversee the construction and operation of the powerful Square Kilometre Array. 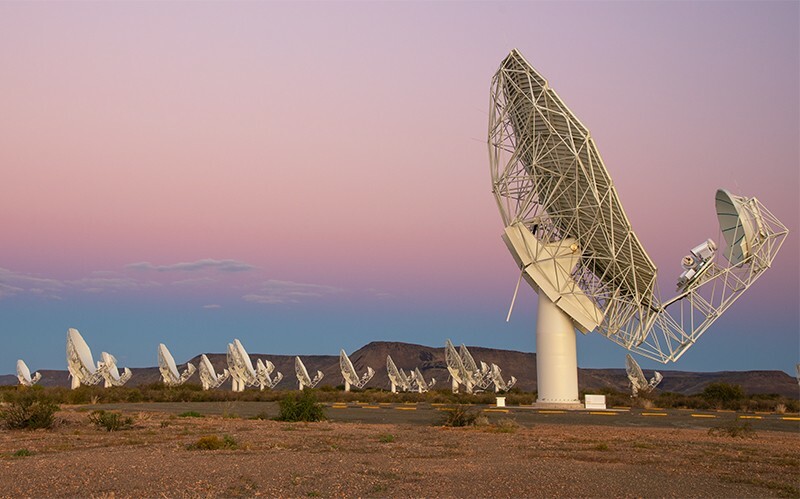 South Africa’s MeerKAT radiotelescope is the prototype for the Square Kilometre Array.Credit: South African Radio Astronomy Observ. Nations involved in the Square Kilometre Array (SKA) — a project to build the world’s largest radio telescope — have signed a convention to establish an intergovernmental organization to oversee the project and formally approve its construction. The body, called the SKA Observatory, will be similar to organizations such as CERN, Europe’s particle-physics laboratory near Geneva, Switzerland, and will replace the SKA Organization, which has managed the telescope’s design and pre-construction activities since its establishment in 2011. The observatory, which is set to be headquartered near Manchester, UK, will have greater authority than the organization and will award contracts for the array’s construction. In the first, €674-million (US$760-million) phase, 130,000 antennas will be built in Australia, and more than 130 dishes will be added to South Africa’s 64-dish MeerKAT telescope, the project’s test bed. Construction is expected to begin in late 2020 and to take about seven years. Twelve countries are currently involved in the project, but only seven — Australia, Italy, South Africa, the Netherlands, the United Kingdom, Portugal and China — signed the convention on 12 March as founding members. Sweden and India are also expected to sign up as full members.